This Thursday, May 15, McDonald's is offering a free Southern Style Chicken Sandwich to everyone who purchases a medium or large drink. 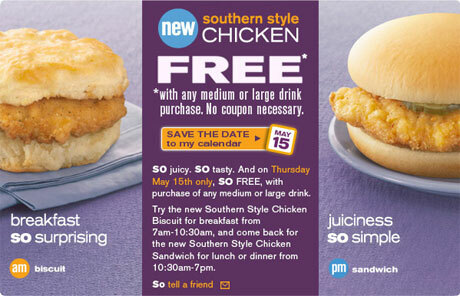 You can get a free Southern Style Chicken Biscuit at breakfast (7am - 10:30am) and then you can come back and get a Southern Style Chicken Sandwich for lunch or dinner from 10:30am to 7pm. I am the first one to leave a comment. I had the breakfast sandwich it really wasn't bad at all.. The question is... Do you like pickles?? It does not have pickles on the sandwich, but it tastes as if it does.. could be the "Southern Style" part of the sandwich. Either that or I want some pickles.. Hmm.. I don't know ;-D Either way the sandwich was free. It actually felt like it sat in my stomach for hours afterwards. A lump of indigestible matter. McDonald's is my new favorite place! I can't believe how many coupons for free sandwiches I have gotten over the last few months. On the day they were giving away the free sandwiches I went twice! And I don't get the other commenter at all. This chicken is better quality than their nuggets or their "McChicken" sandwich. I love them both.